I recently completed reading the book titled Rich Dad, Poor Dad, which I became hooked on immediately. In the first chapter alone of this book, I was astound by the message it told and how it set the pace for the rest of the book. The book itself is about how to achieve financial success, although its message went beyond that and can also be used in every aspect of life. The message was simple, but a message that most people would never realize or take the time to think about if they were never told it. I started reading this book before I went to bed one night and my mind was so blown away afterward that I couldn’t stop thinking about it! So before I go into the message and lessons that this book will teach you, I need to give you some background information on the book. The story line of this book is of actual events that took place during the author’s life. The authors name is, Robert Kiyosaki. 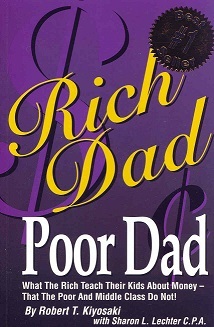 Starting from when he was a child he was given financial advice from his biological father who in the book is referred to as “poor dad”, and his best friend’s father who he refers to as his “rich dad”. His biological father “poor dad” is was well educated and had a good teaching job, whereas his friend’s father “rich dad” who he spent a lot of time with growing up only had an 8th grade education but owned many businesses and was well off financially. Over the years and spending a lot of time with both of them, Kiyosaki realized that both of his fathers had very different mindsets financially. The “poor dad” although well-educated and had a respectable teaching job thought conventionally, which was to go to work every day to pay the bills. Whereas the “rich dad” thought in an unconventional way or different way than most people when it came to working and finances. The “rich dad” believed that you “shouldn’t work for money, but instead make money work for you”. When Kiyosaki was only 9-years-old him and his best friend Mike wanted to learn how to make money, and after a few trial and errors with trying to make money on their own they became discouraged and turned to a person they knew made a lot of money for advice, Mike’s dad a.k.a the “rich dad”. Mike’s dad was happy to teach them and what he taught them at that young age changed Kiyosaki’s financial life forever. The truth is the rich DO work for money, in fact, they work extremely hard to acquire it. This section of the book can be confusing for some depending on how you interpret the message. Although the rich DO work for money, they’re NOT working for money. Now as you can tell this can be confusing for some people. The lesson you’re supposed to learn here is that the rich work for Knowledge, not money. Although they’re technically earning money while they work, money isn’t the driving force, knowledge is. In this section, Kiyosaki redefines the terms Assets and Liabilities. In the book, he defines the term asset simply as something that puts money in your pocket, and a liability as something that takes money out of your pocket. Kiyosaki explains that the way to becoming rich is by acquiring assets. Kiyosaki also explains in this section how our education systems teaches us skills and knowledge for getting a job but does not educate us about money. This section of the book explains how financially literate people spend their spare time investing their money in assets instead of spending their paychecks on unnecessary consumer goods. This part of the book goes over the history of taxes and how the permanent creation of the federal income tax came into play. Then the book goes into corporations and the benefits of owning one. The book goes over the tax advantages a personal corporation can have and how a corporation can help shield (protect) your assets. In this lesson, the author basically goes over the importance of monetizing your skills. Whether it’s by teaching knowledge that you’ve acquired or by a craft or trade you’re knowledgeable and well equipped at. This lesson was fairly simple and basically reinforced what a lot of the book already covered, which is, Don’t Work for Money, but instead Work to Learn. Overall I really enjoyed this book. I found the book both entertaining and educational. Although some of the topics and lessons in this book are controversial and up for discussion, I believe that’s one of the reasons that make this book is good because this isn’t your average personal finance book and some of the ideas and topics are unconventional. But don’t take my word for it, read it for yourself! I have a list of books we are going to read for our billionaire blog club. After reading your review, I decided to bump up Rich Dad Poor Dad to January’s book list. Thanks for the review!